Lawmakers are working through the weekend to hammer out a compromise that would avert the fiscal cliff. Candy talks to a panel of congressional leaders in both chambers on the latest negotiations. Joining us: Chairman of the Senate Republican Policy Committee, John Barrasso (R-Wyoming), Rep. Darrell Issa (R-California), Senator Debbie Stabenow (D-Michigan), and Congresswoman Donna Edwards (D-Maryland). Then, Agriculture Secretary Tom Vilsack’s warning on a spike in milk prices next year, and why rural America is losing its influence. Plus, the 2016 race for the White House is underway. We’ll reveal new CNN polls with insights from our roundtable of all star journalists. Joining us: CNN Chief White House Correspondent Jessica Yellin, Karen Tumulty of The Washington Post, Gerry Seib of The Wall Street Journal, and Matt Bai of The New York Times Magazine. Join us on Sunday at 9 a.m. & 12 p.m. Eastern. 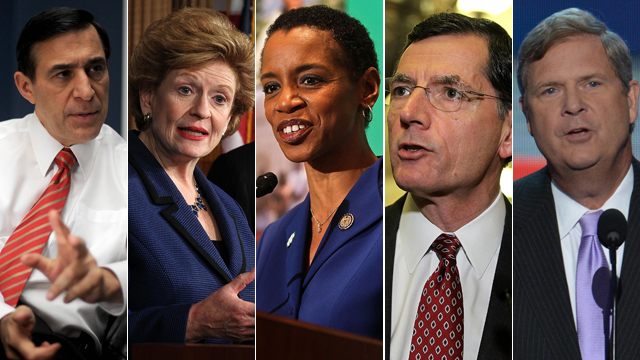 Updated at 5:30 p.m. Saturday: We will be live in the noon ET hour with Sen. Olympia Snowe (R-Maine), Sen. John Barrasso (R-Wyoming) and Rep. Raul Labrador (R-Idaho) and the very latest reporting from Capitol Hill on the fiscal cliff negotiations.